Warm weather and long summer days beg to be enjoyed, unfortunately we often allow these gorgeous days to go unappreciated. Missing out on the summer starts with not realizing your property’s full potential. By taking advantage of your outdoor spaces, you can extend your home’s living area and give yourself plenty reason to venture outside. While traditional air conditioning often drives us indoors in the summer, shaded outdoor areas can be comfortable and inviting. Shade can be provided by partially surrounding the ‘room’ with shrubs or bushes, or it can be introduced by adding a new structure. In addition to blocking the sun, plants naturally cool the air around them. 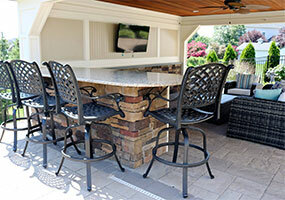 While cool comfort is a must, the specific design and use of your new outdoor space is entirely up to you. Whether you want the space to be for socializing, cooking, or quiet relaxation, once you determine the primary function of the new room, you can flesh out the details of how it will all fit together. While your immediate budget may temper your dream plans for that gourmet outdoor kitchen or the posh cabana complete with wet bar and HDTV, remember that not everything needs to be done at once. 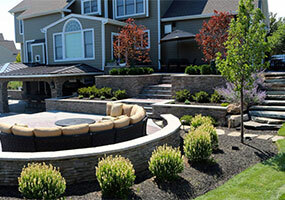 With the proper help, you can formulate a plan to add elements in stages over time. Give us a call today, and we’ll help you create the perfect space where you can take back your summer.